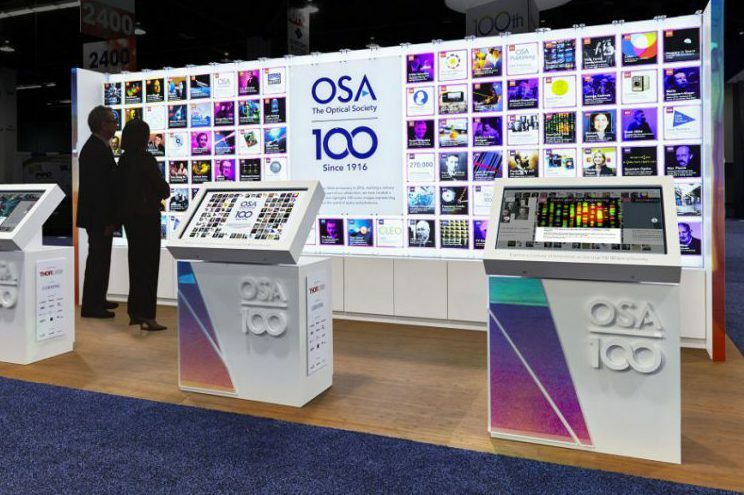 The Optical Society, or OSA, describes itself as the leading professional association in the world of optics and photonics. For the non-scientists among us, that means they promote the science of light, something OSA advances through professional publications, meetings, and membership programs. 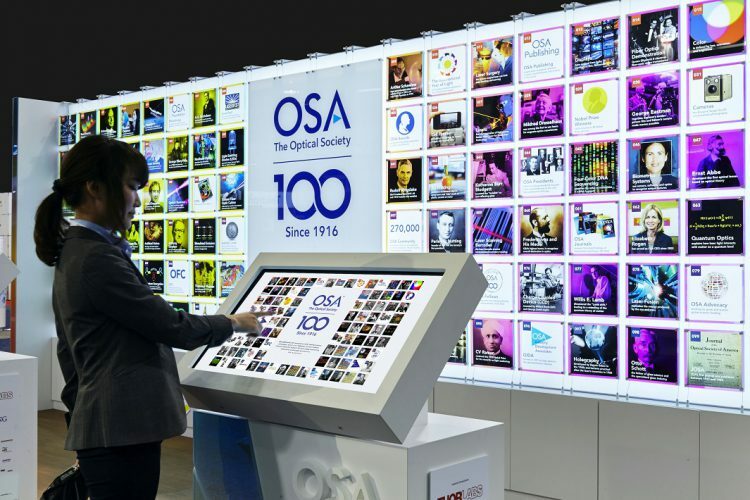 Founded in 1916, OSA celebrates its 100th birthday this year. To add to the party, C&G Partners and Art Guild were asked to create a Centennial Exhibit that told the story of OSA’s rich history and accomplishments. 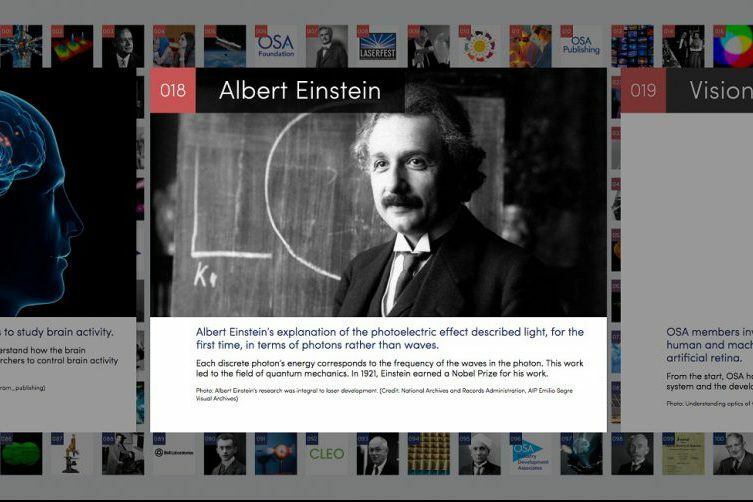 The idea was to highlight the 100 most iconic achievements in the world of optics and photonics. These spanned scientific advancements in medicine, health, telecommunications, homeland security, and consumer technology. To make it that much more interesting, the exhibit needed to be mobile and durable enough to travel to 20 destinations before finding a permanent home. 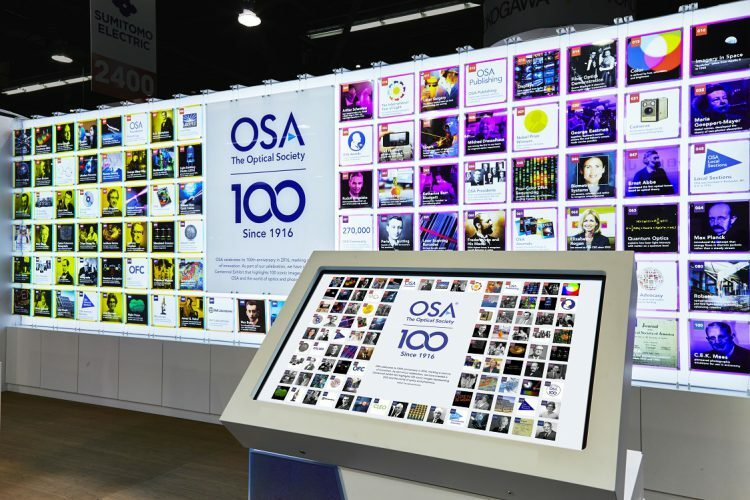 The beautiful solution – shown in the slide show above – featured three interactive touchscreen kiosks in front of a wall showing a grid of all 100 achievements. Tapping an image – for instance the one about Albert Einstein’s discoveries in quantum mechanics – reveals more information designed to be appealing to both novices and experts. C&G gets credit for design. Art Guild’s role was fabrication and program logistics management.